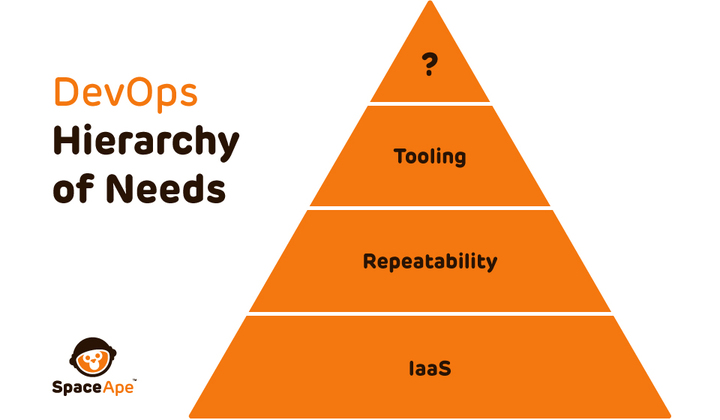 Is there such thing as a DevOps Hierarchy of Needs? In 1943 the psychologist Abraham Maslow proposed the concept of a ‘hierarchy of needs’ to describe human motivation. Most often portrayed as a pyramid, with the more fundamental needs occupying the largest space in the bottom layers, his theory states that only in the fulfilment of the lower-level needs can one hope to progress to the next strata of the pyramid. The bottom-most need is of course physiological (i.e. food, shelter, beer etc); once this is achieved we can start to think about safety (i.e. lets make sure nobody takes our beer) then we start looking for Love and Self Esteem before ending up cross-legged in an ashram searching for Self-Actualization and Transcendence. Is this a Devops blog or what? Yes, yes it is. The suggestion is not that we should all be striving for Devops Transcendence or anything, but that perhaps the general gist of Maslow’s theory could be applied to coin a DevOps Hierarchy of Needs, and we could use the brief history of our own Devops team at Spaceape to bolster this idea. In the beginning there was one man. This man was tasked with building the infrastructure to run our first game, Samurai Siege; not just the game-serving tier but also a Graphite installation, an ELK stack, a large Redis farm, an OpenVPN server, a Jenkins server, et cetera et cetera. At this juncture we could not even be certain that Samurai Siege would be a success. The remit was to get something that worked, to run our game to the standards expected by our players. Some sound technological choices were made at this point, chief of which was to build our game within AWS. With very few exceptions, we run everything in AWS. We’re exceedingly happy with AWS, and its suits our purposes. You may choose a different cloud provider; you may forego a cloud provider altogether and run your infrastructure on-premise. Whichever it is, this is the service that provides the first layer on our DHoN. You need some sort of request driven IaaS to equate to Maslow’s Physiological layer. Ideally this would include not only VMs but also your virtual network and storage. Without this service, whatever it might be (and it might be as simple as, say, a set of scripts to build KVM instances), you can’t hope to build toward the upper reaches of the pyramid. If AWS provided the rock on which we built our proverbial church, we found that the church itself needed some repairs, someone had stolen the lead from its roof. Another sound technology choice that was made early was to use Chef as the configuration management tool. Unfortunately – and unsurprisingly given the mitigating circumstances – the implementation was less than perfect. It appeared that Chef had only been used in the initial building of the infrastructure, attempts to run it on any sort of interval led inevitably to what we had started to call ‘facepalm moments’. We had a number of worrying 3rd party dependencies and if Chef was problematic, Cloudformation was outright dangerous. We had accrued what is commonly known as technical debt. Clearly we had a lot of work to do. We set about wresting back control of our infrastructure. Chef was the first victim: we took a knife to our community cookbooks, we introduced unit tests and cookbook versioning, we separated configuration from code, we even co-opted Consul to help us. Once we had Chef back on-side we had little choice but to rebuild our infrastructure in its entirety, underneath a running game. With the backing of our CTO we undertook a policy of outsourcing components that we considered non-core (this was particularly efficacious with Graphite, more on this one day soon). This enabled us to concentrate our efforts and to deliver a comprehensive game-serving platform, of which we were able to stamp out a new iteration for our now well-under-development second game, Rival Kingdoms. 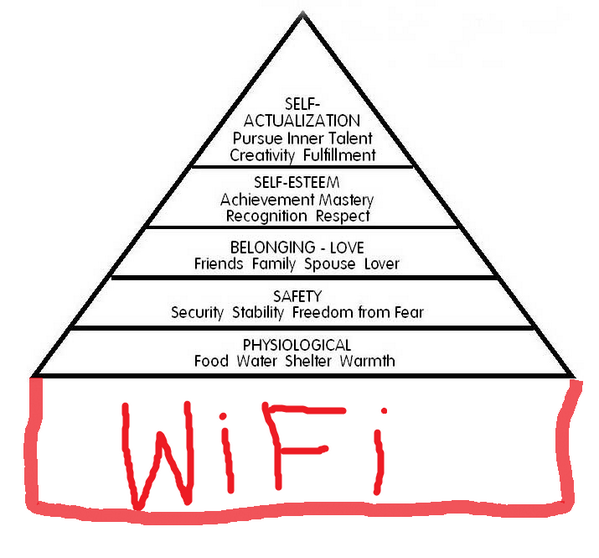 It would be easy at this point to draw parallels with Maslow’s second tier, Safety. Our systems were resilient and monitored, we could safely scale them up and down or rebuild them. But actually what we had reached at this point was Repeatability. Our entire estate – from the network, load-balancers, security policies and autoscaling groups through to the configuration of Redis and Elasticsearch or the specifics of our deployment process – was represented as code. In the event of a disaster we could repeat our entire infrastructure. Now, you might think this is a lazy observation. Of course you should build things in a repeatable fashion, especially in this age of transient hosts, build for failure, chaos monkeys, and all the rest of it. The fact is though, that whilst this should be a foremost concern of a Devops team, quite often it is not. Furthermore, there may be genuine reasons (normally business related) why this is so. The argument here is that you can’t successfully attain the higher layers of our hypothetical DHoN until you’ve reached this stage. You might even believe that you can but be assured that as your business grows, the cracks will appear. At Spaceape we were entering Phase 3 of our Devops journey, the team had by now gained some and lost some staff, and gained a manager. The company itself was blossoming, the release date of Rival Kingdoms had been set, and we were rapidly employing the best game developers and QA engineers in London. With our now sturdy IaaS and Repeatability layers in place, we were able to start construction of the next layer of our hierarchy – Tooling. Of course we had built some tools in our journey thus far (they could perhaps be thought of as tiny little ladders resting on the side of our pyramid) but its only once things are standardised and repeatable that you can really start building effective tooling for the consumption of others. Any software that tries to encompass a non-standard, cavalier infrastructure will result in a patchwork of ugly if..then..else clauses and eventually a re-write when your estate grows to a point where this is unsustainable. At Spaceape, we developed ApeEye (a hilarious play on the acronym API) which is a RESTful Rails application that just happens to have a nice UI in front of it. Perennially under development, eventually it will provide control over all aspects of our estate but for now it facilitates the deployment of game code to our multifarious environments (we have a lot of environments – thanks to the benefits of standardisation we are able to very quickly spin up entirely new environments contained on a single virtual host). And so the launch of Rival Kingdoms came and went. It was an unmitigated success, the infrastructure behaved – and continues to behave – impeccably. We have a third game under development, for which building the infrastructure is now down to a fine art. Perched as we are atop our IaaS, Repeatabilty and Tooling layers, we can start to think about the next layer. But what is the next layer? It probably has something to do with having the time to reflect, write blog posts, contribute to OSS and speak at Devops events, perhaps in some way analogous to Maslow’s Esteem level. But in all honesty we don’t know, we’ve but scarcely laid the foundations for our Tooling level. More likely is that there is no next level, just a continuous re-hashing of the foundations beneath us as new technologies and challenges enter the fray. The real point here is a simple truth – only once you have a solid, stable, repeatable and predictable base can you start to build on it to become as creative and as, well, awesome as you’d like to be. Try to avoid the temptation to take shortcuts in the beginning and you’ll reap the benefits in the long term. Incorporate the practices and behaviours that you know you should be, as soon as you can. Be kind to your future self.